This interview was conducted by phone on 19-09-2003 for my former website Fightingmaster.com. Copyright by Kostas Fantaousakis. Ramon was a man of action and not a man of words, so he did not speak much. He answered in a straightforward manner and occasionally showed me that he had a good sense of humor. A true legend. Rest in peace! This article is provided in memory of Ramon Dekkers and is not intended to generate income for myself or anybody else. 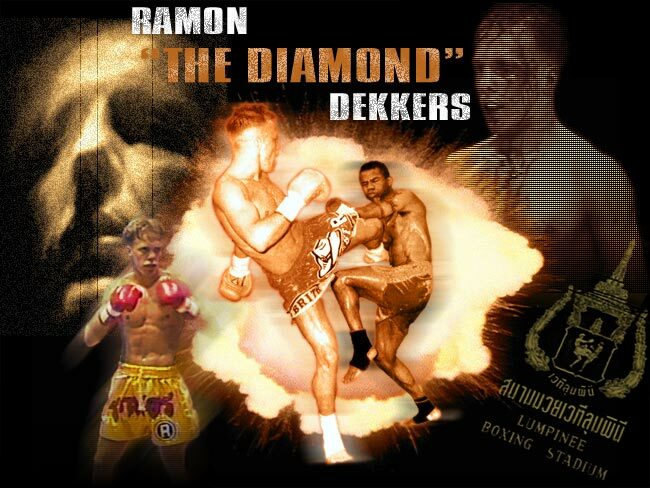 All photos are from the "We are kickboxers", and "Ramon Dekkers: In memoriam" Facebook pages and are used here under the guidelines of the Fair Use provisions of United States Copyright Law. If you are the copyright owner of a photo and you would like me to remove it or add a copyright caption please e-mail me. Also, If you own photos of Ramon I would be more than happy to post them here. 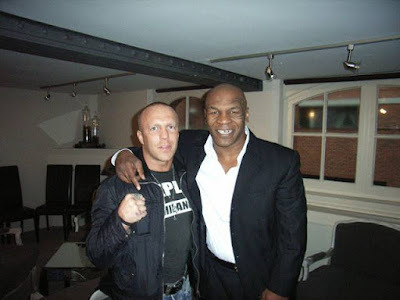 Kostas: What is it that made Ramon Dekkers so unique? Tell us your secret. Ramon: Lots of things, training, technique. But it was natural for me. I think I was born for it. Kostas: When did you start training? Ramon: I was 11 -12 years old. My first martial art was judo for a couple of months. 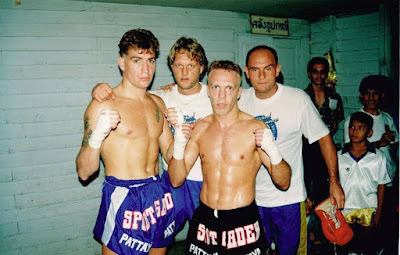 Then I started training in boxing for one and a half year and then I started Thai boxing with Cor Hemmers. I was 13 years old. 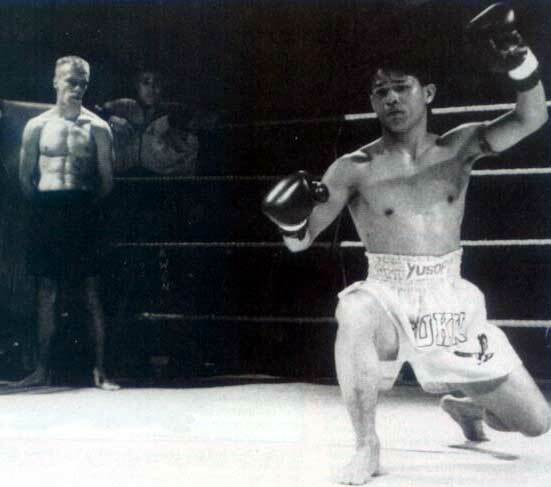 Kostas: Your first title was Dutch champion against some guy from Chakuriki gym. Ramon: Yes when I was 18. Ramon: In various organizations and different weight categories. Kostas: Can you tell us some of the organizations? Ramon: I think it was all the Thai boxing organizations. Kostas: You became a champion in all of them? Kostas: Who was your greatest opponent from Thailand? Ramon: Nangpon. But the most famous fights were against Coban and Sangtienoi. Kostas: You fought Coban 4 times. You won 2, he won 2. I read somewhere that in your first fight there was some problem with you and you lost. Did he knock you out? Kostas: According to Coban, your fourth fight was not a real fight for him because the promoters set him up. He claims that he wasn't supposed to fight you; that he was supposed to fight someone else. When he got to the ring, he saw you. 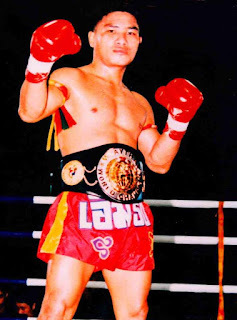 Ramon: I do not know about that, but in a fight with him, the promoter said that I would fight another Thai , so I came to Thailand, I went to the ring and then Coban was there. I didn’t know that he would be there. I knocked him out on the first round. Kostas: Do you think that there is a problem with winning on points in Thailand? Ramon: There is a different kind of point counting. Knees and elbows give you much more points than punching or kicking. Kostas: Do you think that the point system has to change? Kostas: I believe that sometimes you fought 2 fights in one week. Ramon: Yes. At one time I was fighting in Bangkok on Saturday and I would fight on Friday in Paris. Ramon: Yes but I was young and for me it was not a problem at the time. Kostas: You were elected fighter of the year in Thailand, did you get to meet the king of Thailand? Ramon: No, I almost did but it did not happen. But I met generals and important people. They gave me an award as best foreigner in Thai boxing. Kostas: Do you miss being in Thailand, Ramon? Ramon: Yes but I go there almost every year. Kostas: Do they still remember you? Ramon: Yes, everywhere. They say that I have changed because now I am older but they still remember me. Kostas: Do you think that if someone wants to learn real Thai boxing he has to go to Thailand? Ramon: No. come to my gym and you will see. (Ramon laughs as he says this). Ramon: In the beginning I fought a lot in Europe. But then there was nobody that I could fight. Nobody wanted to fight with me. That is why I fought so many times in Thailand. Ramon: They wanted to try because they knew I was injured and knew that they had a chance. Kostas: Yes but you managed to beat some great opponents later in your career when you were injured and had so many problems. What gave you so much strength going in to the ring knowing that there was not 100% of you against your opponents? Ramon: I do not know. I just love fighting. When somebody challenged me, I could not say no. And then we would see who is stronger. It was their chance to fight me because they could win a lot of money and be famous if they beat me. Kostas: You have an impressive list of knockouts. Kostas: So the percentage of someone fighting against you was that 50% he would be knocked out and only 10% that he would win and just on points. What is your secret on knocking out so many opponents? Ramon: It is my way of fighting. I do not like to win on points. I go for the knockout. I try to hit very hard. Left hook, everything, as hard as possible. And they go down. Kostas: Sometimes in your ringside I saw another great fighter, Rob Kaman. Tell us about him. Kostas: So in your beginning he was more experienced than you. You were in Thailand together. Did he help you? Ramon: In the beginning when I fought in Thailand he was always with me because he was living there. Kostas: What do you think of Gilbert Ballantine? You fought him 3 times and you won the last one. Ramon: In our first fight I was very young. In our second fight it was an easy fight for me. If you see the tape of that fight, I won 100%. Kostas: G.B. was a very aggressive fighter. He would try to punch you and almost get out of the ring in doing so. Ramon: He was a difficult fighter. I had been fighting 7 years in Thailand and then G.B was the first one from Europe. It was very difficult for me to fight suddenly against G.B. He was such a different fighter than the Thais. Kostas: What do you think of Rayen Simson? You fought him once and lost. Ramon: Very good fighter. But three weeks before that fight I had a surgical operation on my leg. So I was not in the fight 100%. Kostas: What do you think of Ernesto Hoost, 4 times K1 champion? 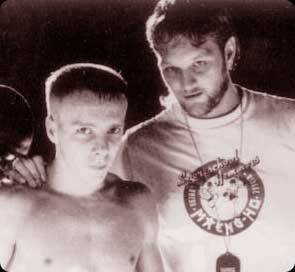 I think that you, Rob Kaman and E.H. are 3 of the best kickboxers ever. Ramon: I think so too. Peter Aerts is also a very good fighter. He won the K1 3 times. Kostas: What do you think of the K1 tournament? Ramon: It is OK but I prefer real Thai boxing. Kostas: What do you think of kickboxing without knees and elbows. Ramon: It is not the real thing. 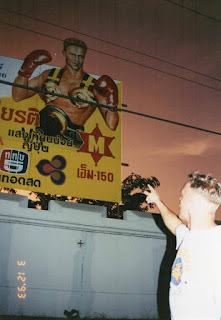 I always fought Thai boxing. Not always with elbows but still Thai boxing. Kostas: What do you think of the MMA events like Pride or UFC? Ramon: I don’t like it. I don’t like grappling on the ground, I think it is very boring. The technique is very low in striking. Kostas: Now in these events former kick boxers start to win against grapplers, I mean when they learn some grappling. Ramon: Yes because kicking and punching will always be important. If you learn some grappling you will be a very good MMA fighter. Kostas: How many times did you fight in Japan? Kostas. : The Japanese have a sense of showmanship. They organize spectacular events. Did you like that? Ramon: Yes, that is a good thing… More people come to watch. Kostas: Have you ever fought in America? Kostas: Yes it is. If you had the chance of learning another martial art which one would it be? Ramon: I don’t know. I would not choose another one. I would stay in Thai boxing or maybe boxing. Kostas: Perhaps some grappling art? Kostas: If you could start your career over from the beginning, are there any mistakes that you would avoid doing again? Ramon: I would not fight that much…If I had fought more slowly I would still be able to fight today. Kostas: You were part of the Golden Glory team. Was Cor Hemmers the trainer? 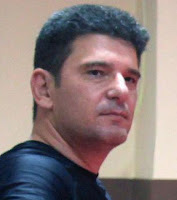 Kostas: Do you teach your fighters like Cor taught you or you have your own way of teaching? Ramon: I have my own way. And I only teach my fighters what works in the ring. Kostas: Cor Hemmers was your only trainer. I saw some clips of you training with him using the pads. You were like two parts of a machine together. Ramon: Yes because we did it so many times and so long. So many years. Kostas: Why is training with a partner that holds the pads so important in training in Thai boxing? Ramon: Because you can use a lot of combinations in boxing and kicking. Kostas: Why does a Thai boxer have to use combinations when he trains? Ramon: Combinations are good for the muscles of your arms. If you can make in 2 minutes 100 punches, it becomes so easy to make 10 in two minutes. For conditioning it is very good. Kostas: Do you think that western boxing should be used more in Thai boxing? Ramon: Yes, punching is one of the most important things in Thai boxing. Kostas: You liked to hit your opponents very hard but in order to do so you came very close and there was a danger of being hit yourself. Ramon: That is the way of fighting for me, I try to do everything very hard. But when I fight, I think a lot also. I always have a strategy. Kostas: What is your main strategy? Ramon: It is always different. Depends on the opponent. Kostas: You always watched fights of your opponents…. Ramon: Yes, before the fight; but in the ring sometimes you have to find a new strategy… a different one. Kostas: What is the best weapon of Thai boxers? Knees, elbows, low kicks? Ramon: Everything. You have to be good at everything and hit very hard. Kostas: Do you thing that a kick boxer without ring experience in low kicks or knees and elbows can survive in the ring against a real Thai boxer? Kostas: How can a fighter make his shins harder for low kicks? Ramon: Mostly by hitting the heavy bag. Kostas: Do you think that Thai boxing should continue in using the elbows? Kostas: Do you think that hitting hard is something someone is born with it or is it just a matter of technique? Ramon: I think you are born with it but technique also helps. Kostas: What advice would you give to the young Thai boxers who are just starting out? Ramon: My advice is: train very hard for every fight. Always be serious with your sport and train hard. It is one of the most important things. Train every day if possible. Kostas: I know that fighting was very important to you. Now that you decided to give your energy to training, is it the same for you? It must be very hard not to fight. Ramon: Not so much because I fought so many times and too much. It is very good for me to stay in muay thai and Thai boxing and teaching. I like it very much. I just opened my gym in Breda. Soon I will have a website for it called “Team Dekkers”. I started 2 weeks now and I have a lot of students. It is too busy. Kostas: Is there anything you would like people to know about you? Ramon: I have my own gym. Everybody is welcome to visit and train over there. I am also available for seminars. Kostas: Tell us your future plans. What would you like to do in the following years? Ramon: Make a name for my school with good professional fighters and give seminars.